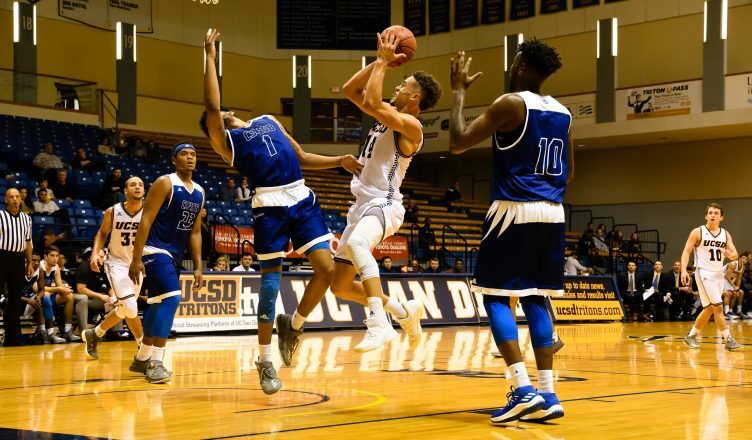 Last Friday, the UC San Diego men’s basketball came out strong, defeating Cal State San Marcos 78–66. With this victory, the Tritons rose to 5–3 in overall record and maintain an undefeated record (2–0) in conference play. Through the first half, momentum flip-flopped between the two teams. Four minutes into the half, it seemed as if the Cougars were going to run away with the game, scoring eight unanswered points, taking their lead to nine (8–17). However, a pair of free throws by senior forward Michael Shoemaker enlivened the Triton offense. The Tritons went on a tear, flipping the script on the Cougars, to go ahead by nine points (30–21). But just as momentum seemed to turn in the Tritons’ favor, it flipped back in favor of the Cougars. By the end of the half, Cal State San Marcos was able to reclaim a small, one-point lead (35–36). In the second half, Tritons took control of the game and had a dominant performance. After allowing the Cougars to score the first points of the half, the Tritons took the lead and never gave it up. In this half, UCSD showed itself to be the superior team; the Tritons recorded better percentages in shooting behind the arc, inside the arc, and from the free-throw line. With this dominance, the Tritons coasted to a 78–66 victory. UCSD’s ability to score off turnovers was key to the team’s victory — the Tritons generated 22 points off of 10 total turnovers. Junior guard Christian Bayne had an exceptional game, recording a game-high 24 points, two assists, and two steals,. Next Friday, UCSD looks to extend its win-streak to three, facing off against Cal State Monterey Bay at home. Tipoff is scheduled for 7:30 p.m.